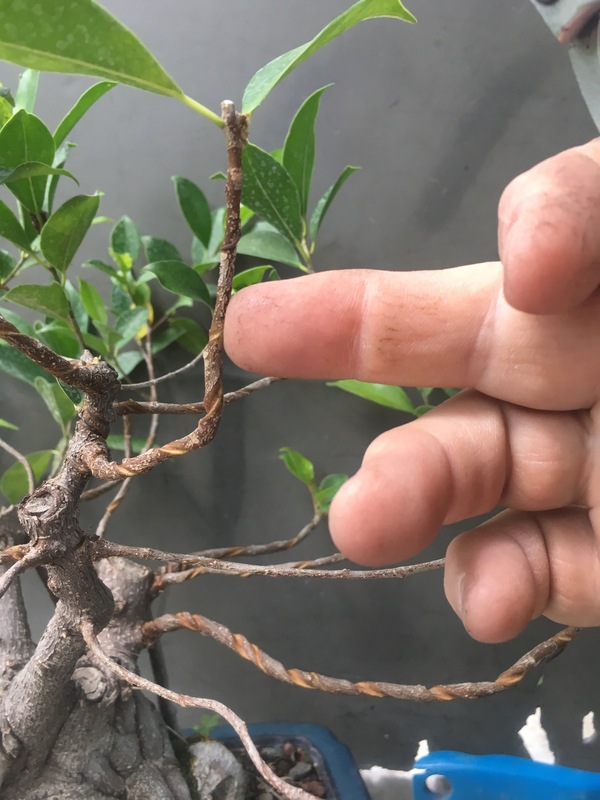 You might remember this tree, its was featured in the epic, groundbreaking and confirmationally biased blogpost, ” I use some fancy words to justify my defoliation habit, go figure“. 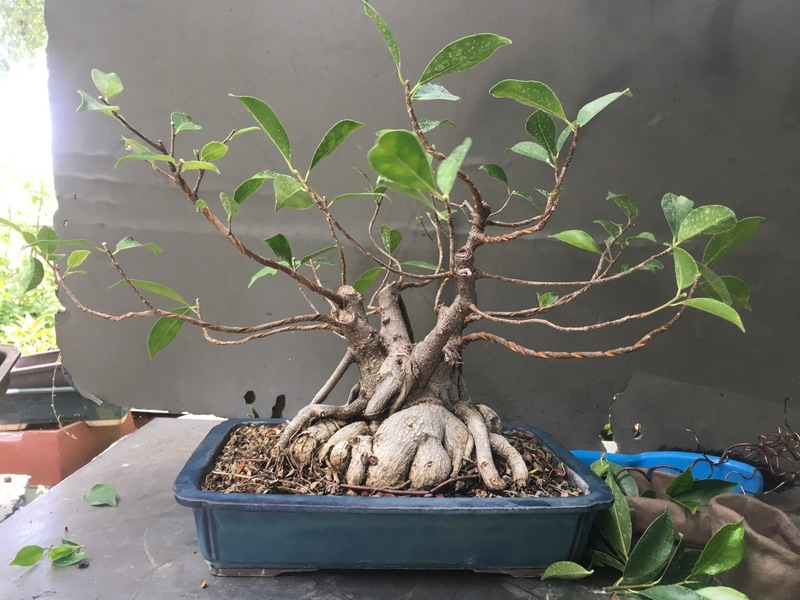 It’s a ficus microcarpa, sometimes described as a “ginseng”, as though it’s a separate variety. P’shaw! 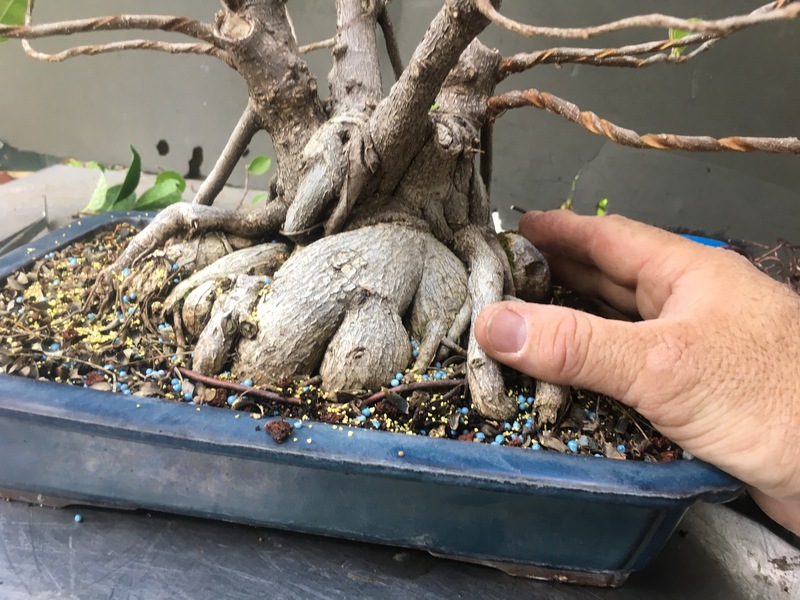 They’re really just ficus grown from seed, hence the bulbous caudiciformogical root bulge, and called “ginseng” for marketing purposes by marketing porpoises. Now, I know what you’re saying, I’ve heard it before. You’re saying “You’ve gone and done it now Wonka!” “You’ve ruined your watershed!”…… I mean “You’ve let the wire dig into the branch, ruining it!” Nah! Think about this, that branch will be 2 to 3 times thicker than it is now in a few years. The wire marks will. E long gone before I show the tree in an exhibit. All I’ve done is caused some gnarliness. Rest easy, keep the emails to a minimum. It’s not the end of the world. 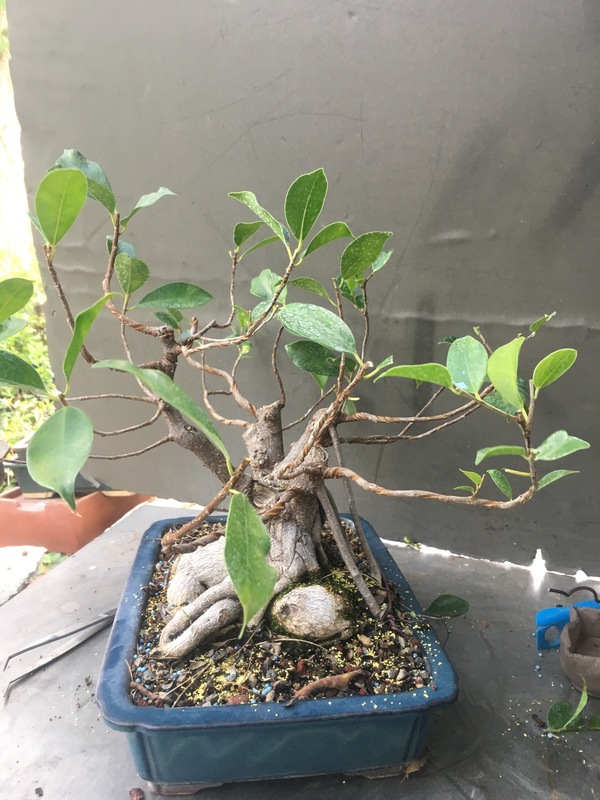 It’ll be okay, my dear friends, it’s a ficus. 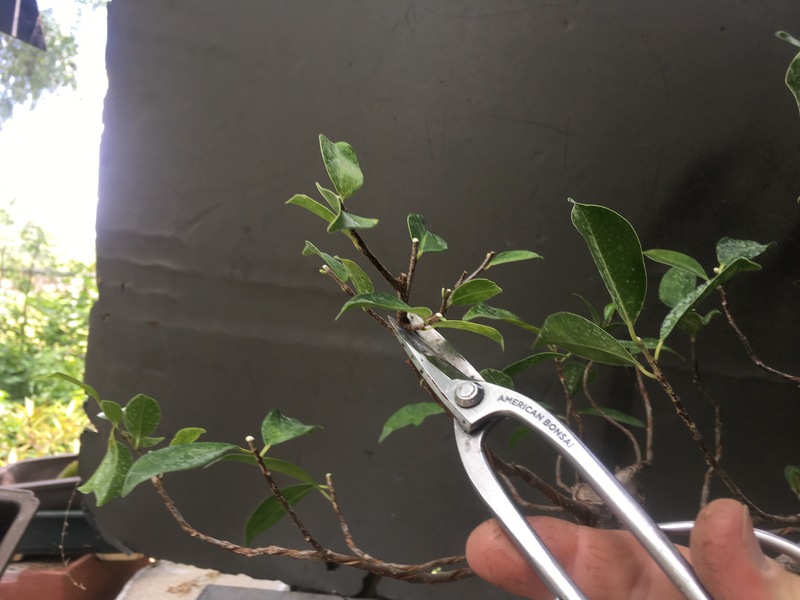 So now it’s time to cut the tips and encourage back budding (don’t make me repeat myself about those hormones, you know, the auxins and the cytokinins and all that, it’s all in the above linked blogpost). As I prune, on this fig, the microcarpa, I like to leave at least one or two leaves. Like here: I’d prefer to prune back to where my middle finger is pointing (yeah, take that!) But it’s very likely to abort that branch altogether. Not sure why, most of the microcarpa varieties back bud amazingly, but the specie doesn’t. 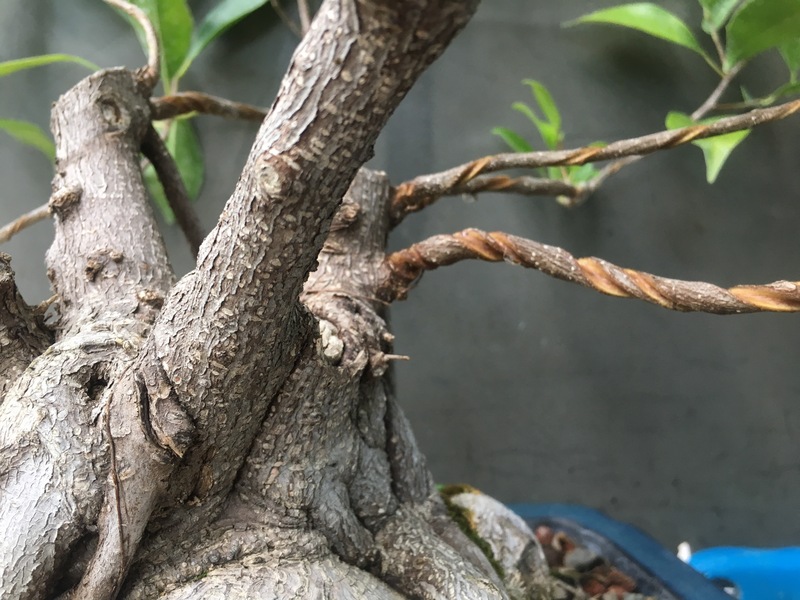 To the pruning, right? The above branch has been the strongest on the whole tree. In the previous blogpost, it was the only one I cut the growing tips on. It’s a process, grow, wire, grow, unwire, rewire, grow. In this case I’m not going to rewire again until maybe June. 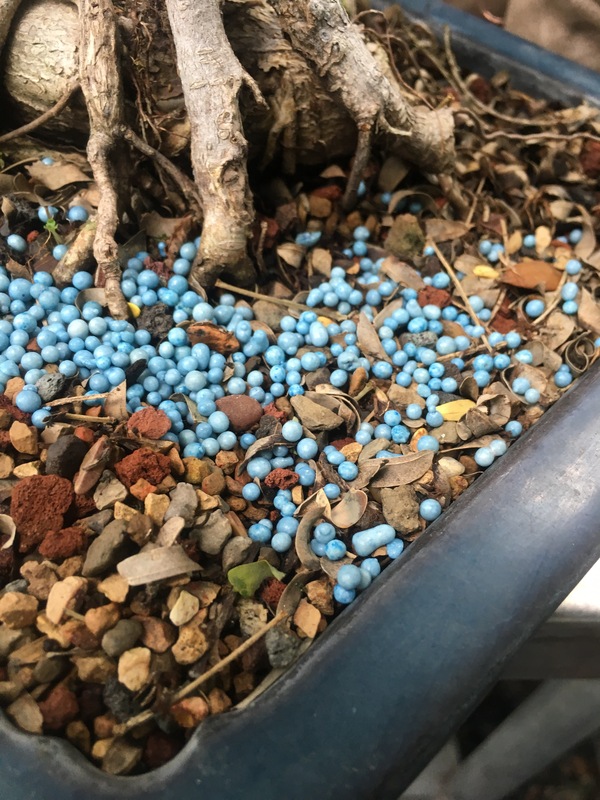 Which means it’s a good time for some synthetic fertilizer…… I call this radioactive blue. Let’s do a short lesson on fertilizer, ok? There are two basic forms: granular and liquid. That’s pretty self explanatory. Granular goes on or in the soil and the idea is to provide nutrients every time you water and stays there for several months. Liquid is applied to the leaves and soil and is absorbed by the tree as you apply it. You might get some residual nutrients if your soil has a decent cation exchange capacity, such as a clay or organic based mix, but mostly it drains out of the bottom of the pot. Then there are two kinds, organic and synthetic. What’s the difference? It’s easy too, because nitrogen is nitrogen, potassium is potassium etc. The difference is in the action of delivery. Synthetic fertilizers have all the nutrients available immediately for the plant to use, in a form they can use. They work. Sometimes too well. 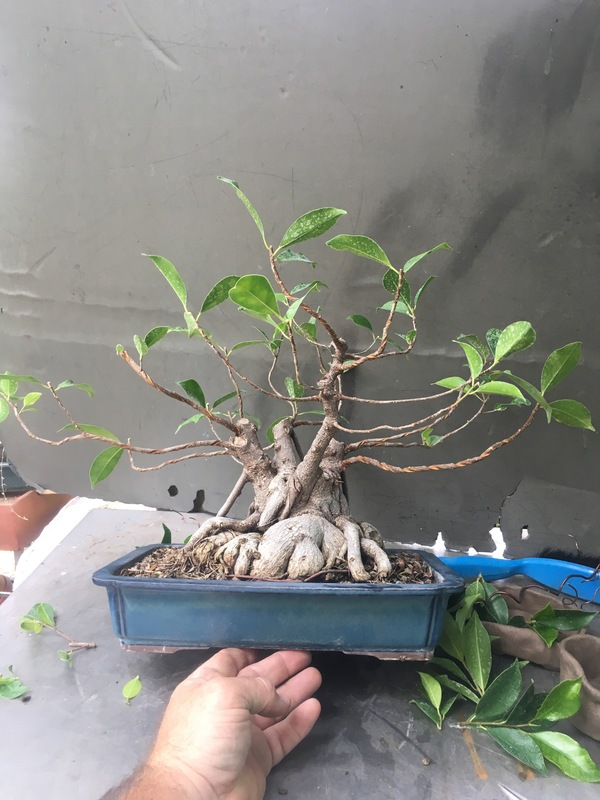 If I have a tree in a bonsai pot with synthetics, and every branch is wired and I forget about it, I might have really ruined the branches because those wires could possibly be permanently embedded in them. I have some trees like that. 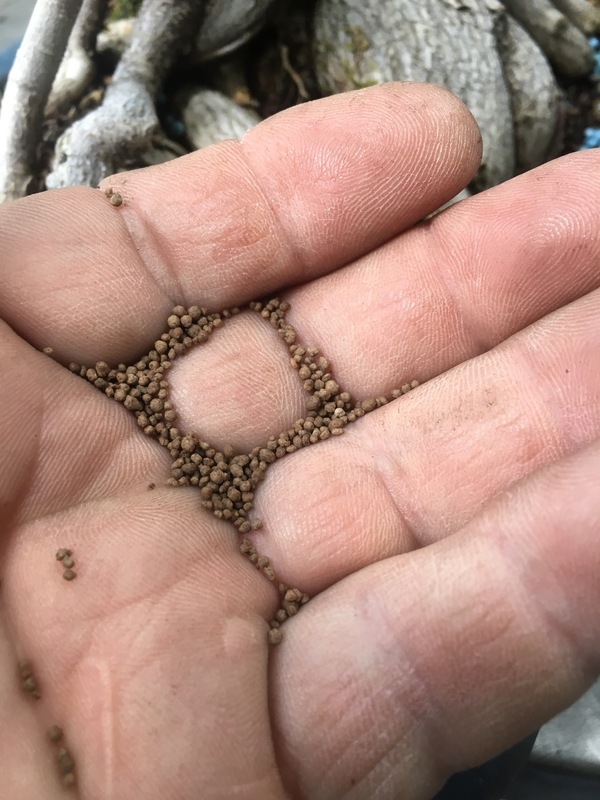 Organic fertilizers have nitrogen and all that too, but it’s usually in a form that needs to be processed, usually by microorganisms like fungus or bacteria, and then the nutrients become available to the plant through some form of symbiosis. This means slower and, sometimes, healthier growth. 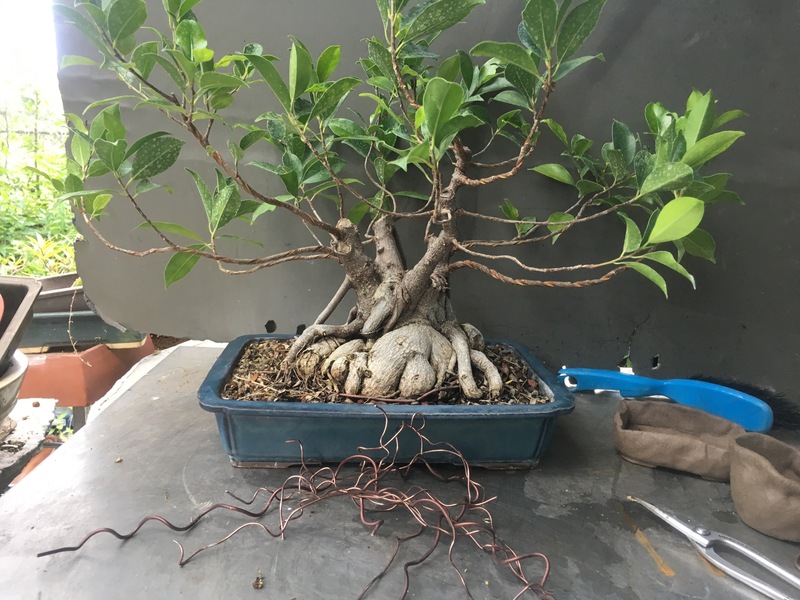 All my trees with wire and in bonsai pots get organic fertilizers. I just can’t keep up with the growth when using synthetics. But there is a place for both. 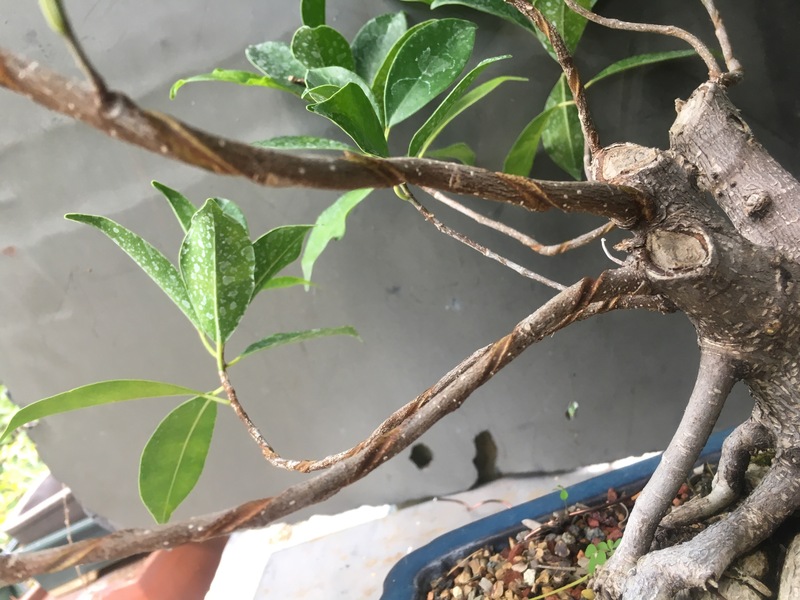 Say you need to get some winter growth on a ficus. Use a liquid synthetic foliar spray and you’ll be golden (er…green). Or if a plant is struggling in the summer, use an organic, cake style fertilizer like SumoCakes, with some microorganisms included in the cake itself, and the tree will respond slower but stronger. But enough on that for now, I’ll be writing a more in depth article on ferts soon, delving into ph, uptake, action and reaction etc. I can’t wait……..it’ll be as fun writing that as my first soil post. 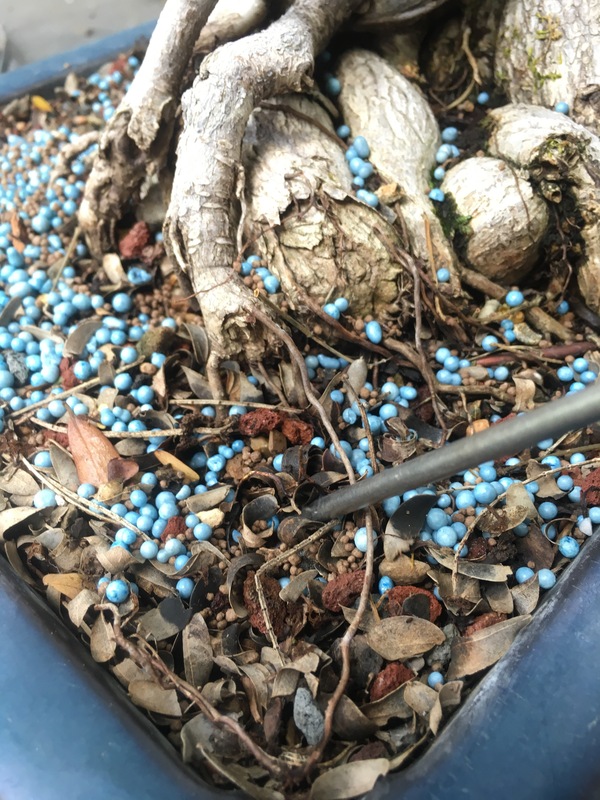 I chopstick it all into the soil because, really, who wants to look at all those radioactive blue granules? They look like Nerds candy. The chopsticking also helps to aerate the soil if it’s compacted at all. And, that’s all. No wire, but lots of water, sun. I will update you in about a month, after I get back from Louisiana probably. 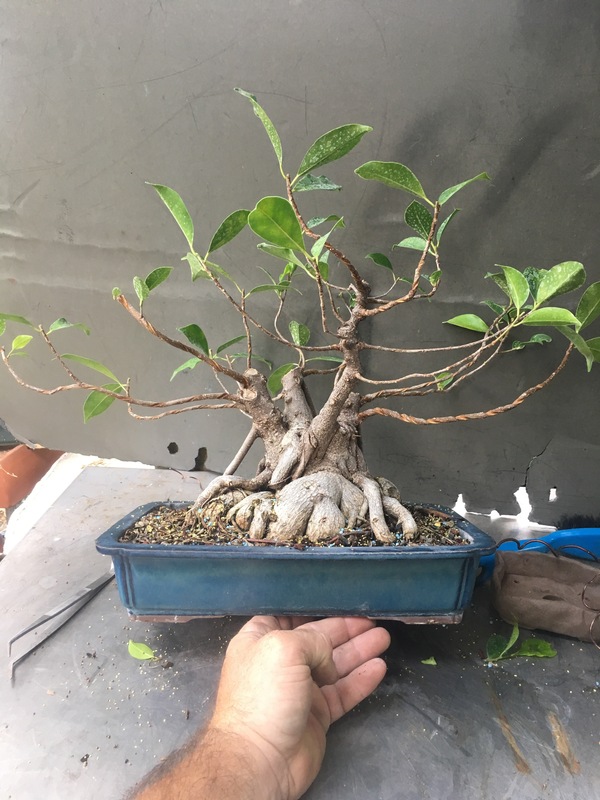 I’ll be in Lake Charles for the Louisiana Day of Bonsai on June 24. Should be a blast, come out and see me, I’ll be the one dressed in black. I’m also doing private sessions for those who are between Orlando and Lake Charles Louisiana. Prev Chop chop chop, is it technique or butchery? Thanks for the pointers on fertilizer. How do you indentify whether it’s synthetic or organic? I’m looking at a few on Amazon, and I don’t see any indication of which type they are. Do you have a favorite brand of synthetic fertilizer? What does the yellow mottling mean? 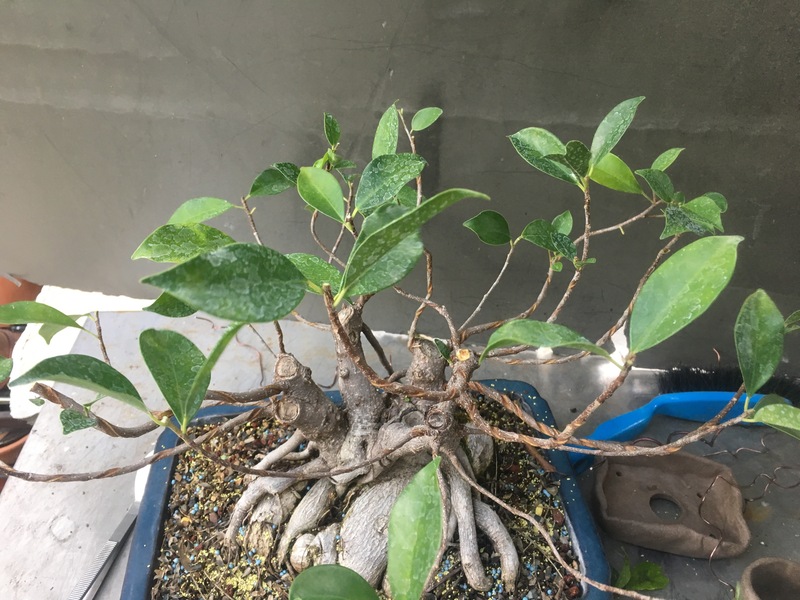 I have a ficus with that and some of the new growth is dying off. In this case it’s just older leaves. 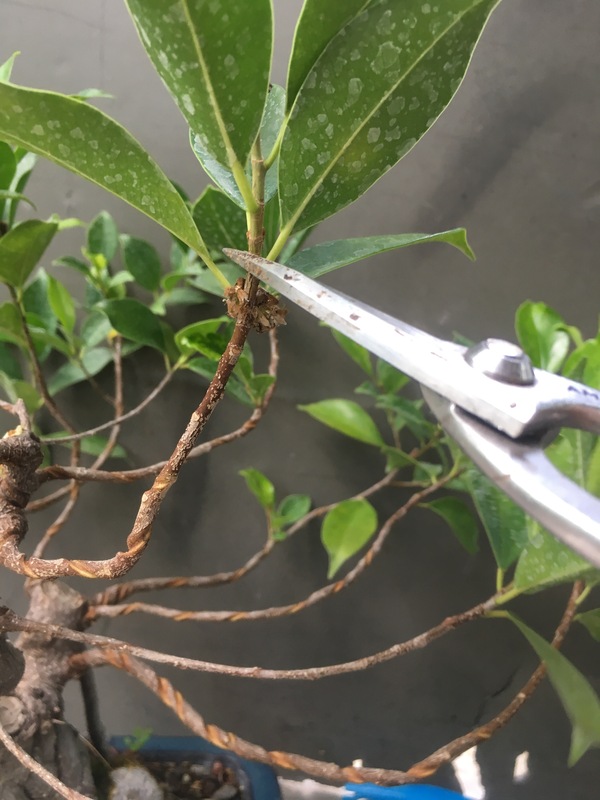 As they age they become less efficient, which is why more frequent pruning on a ficus works well for growth and development, your constantly renewing leaves with new growth. In your case it may be the same thing, being you’re more north than I and have a colder climate. Or it could be a minor nutrient deficiency like iron or maybe your water is too alkaline and the nutrients are “locked”. Test your water for ph to see if that’s the case. It could be not enough drainage in your soil or pot as well. 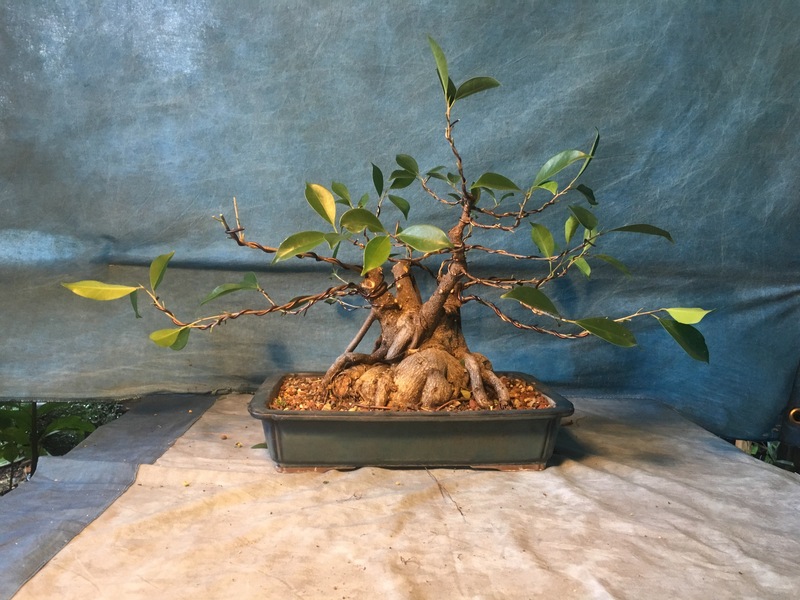 Ido you like the name “Overlord” for that crescent pot ficus? It kinds of reminds me of the Zerg Overlord from Starcraft and it’s because of the shape.